From the day it was announced, Drinking Buddies seemed like a film after my own heart. Director Joe Swanberg’s latest “mumblecore” effort combines two of my favorite things: craft beer and the city of Chicago. Better yet, this was filmed on location at one of the city’s finest breweries: Revolution Brewing. Fans of good beer will appreciate all the little winks and nods at the Midwest’s many craft breweries (my own personal favorite, Half Acre’s Daisy Cutter, makes a cameo), but there is plenty to enjoy for movie lovers as well. The film revolves around two co-workers at Revolution Brewing: Kate (Olivia Wilde) and Luke (Jake Johnson). They are great friends, always fooling around at work and then getting drinks afterward. Kate appears to be “one of the guys”, able to hold her own with the seemingly male-dominated brewery. Luke and Kate have an infectious chemistry and there is an undeniable air of sexual tension between them; the only problem is that their relationship is strictly platonic. Both co-workers are in separate relationships. Luke has been dating Jill (Anna Kendrick) for six years, and they have been talking about getting married. Meanwhile, Kate is in a relationship with music producer Chris (Ron Livingston). Everyone seems happy at first, but it’s awfully hard not to notice how much of a connection there is between Luke and Kate. A couples weekend retreat to a Michigan cabin makes the differences especially glaring. While Luke and Kate are perfectly content to just sit around drinking and playing blackjack, Jill and Chris prefer to hike in the woods. These four couldn’t be more different, but then again, can a relationship really thrive if two people have all of the same interests? This question and many more come into play in Drinking Buddies, and the “will they or won’t they?” stigma is always lingering. Yet what makes the film work is that it doesn’t go down the conventional route. While it sounds and even feels predictable, it isn’t. This film changes directions and takes detours before reaching an abrupt conclusion, one that is sure to split audiences. Through all of this, the film manages to remain incredibly authentic. All of its dialogue is improvised, further adding to the sense of realism. These characters all feel like real people, and hell, you may know some just like them. The entire cast here does a phenomenal job, and Jake Johnson and Olivia Wilde deliver what may be their finest performances yet. The connection between the two is indisputable; they know it and we know it, but they also know it’s unacceptable. 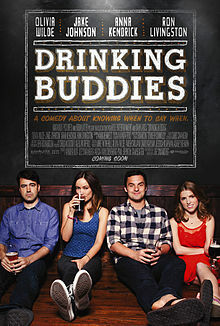 Drinking Buddies is one of the better mumblecore films I have seen, and it examines male and female relationships in a way that isn’t usually realized on screen. While a bit more closure would have been nice, the performances alone make this well worth seeing (preferably with some craft beer on hand, of course). Nice review Eric. The chemistry between everybody here is great and really keeps this movie interesting. Especially Wilde and Johnson who made me feel like they could throw all of the papers off their desk at any second and start banging. Haha, yeah, you could cut that sexual tension with a knife. Great performances. Sounds like a very fun flick. Not just for the cast, (I’m in the camp who believes Ron Livingston is a vastly under rated actor!) but for the twists and turns the plot will take. You do know what a “Half Acre Daisy Cutter” is, don’t you? Great name for a craft beer, by the way. Hey Jack, yeah “Daisy Cutter” is a clever little name. Their summery daisy art work is kind of ironic considering its true meaning. Damn good beer, too. And I agree about Livingston being an underrated actor. He has a bit of a smaller role here, but he nails it. Thanks man, hope you enjoy it.